Archery Target is included as an activity with a purchased Pass. 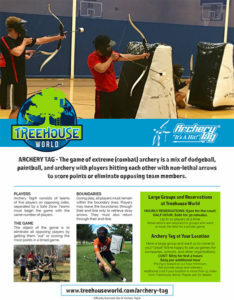 Archery Tag can be used as your choice Adventure Activity (same player, same day) with a purchased Pass. You can play during open hours at Treehouse World. We may match you up with others who are waiting if there is a line or if you don't have enough people to field a team. Group Reservations are accepted any day of the week. Hourly Reservations: $300 for the court. Up to 12 players at a time. Half Hour: $180 for 30 minutes. Have a large group and want us to come to you? Great! We're happy to set up games for companies, schools, and other organizations. Pricing is based on a 2 hour minimum. We provide setup and referees. Additional cost if your location is more than 15 miles from Treehouse World. Please ask for details. Archery Tag - What is it? 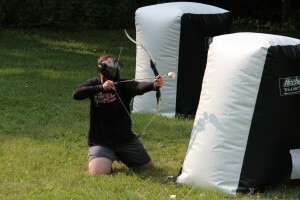 Archery Tag is a new group activity that involves teamwork, tactical maneuvering, and lot's of running around. Players use bows to shoot foam tipped arrows at each other and at targets, attempting to rack up the highest score and take home the glory! Archery Tag is a new, unique activity. 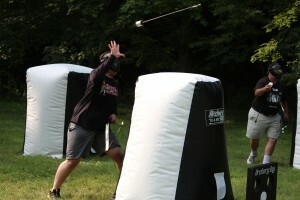 Unlike Paintball, Archery Tag does not hurt or leave a mess. Unlike laser tag, you actually get to shoot a projectile through the air. Unlike dodgeball, there are barriers to take refuge behind. Unlike video games, you get a lot of fun exercise while you play. This is quite simply the only archery game out there. It is safe, exciting, and is a suitable activity for groups of 4-12. 6v6 is the ultimate matchup and the most that we can put on the field at one time. Non-regulation, larger games with up to 24 players can be arranged, but reservations are required and this may not be available during peak times.